Following a weekend of strife that led to mass mod resignations and the forums going offline for days, popular gaming community NeoGAF has reopened this evening. And it’s a mess. 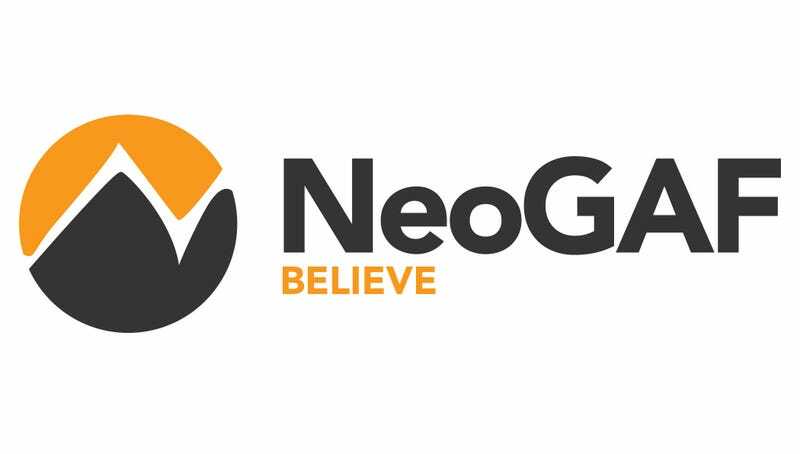 Much of the turmoil has centered around an allegation of sexual misconduct against NeoGAF’s owner, Tyler “Evilore” Malka, who upon getting the site back online issued a lengthy statement about the matter. Those mods remaining after the mass resignations over the weekend have also made an announcement, saying that the site’s controversial “Off-Topic” forums would be temporarily closed down, and when reopened would bar all discussion of politics. The future of NeoGAF will be a return to what many of us have come here for, a place where we can gather together and enjoy our shared hobby of video games. For a short time, Off-Topic Discussion and Off-Topic Community will be closed so that we can rediscover that. We’ll be starting with a clean slate when they come back. However, the focus will be on the many other hobbies we may have like TV, movies, anime, writing, music, etc. Political and social discourse will not be allowed in the new Off-Topic. Those types of discussions greatly added to the harsh and unwelcoming atmosphere of Off-Topic, which pushed many users away. Moderation will also see changes. Over the years, moderators changed from simply people who made sure discussion stay civil into personalities. It’s because of that, many were targeted for harassment and other things. This shouldn’t be happening to them. We’ve taken action to protect these people by making moderation anonymous. There will be no more red-names that single them out nor will there be a list of who is one. An allegation of sexual misconduct has been made against me by an ex. It’s not true, the individual making the accusation isn’t credible, the story doesn’t reconcile logically with the facts, and there’s plenty of evidence and witnesses to corroborate that. It’ll be a process. All allegations of this nature are serious, of course. I first got word of it on Wednesday when a screenshot of a Facebook post was handed to Voat. I immediately talked with my mod team about the contents of the screenshot and clarified that it was baseless and explained some of the details concerning my former associations with her, and tried to ensure any concerns from the team were addressed fully and transparently to everyone’s satisfaction. On Thursday I heard that she had deleted the accusation from Facebook, and wasn’t entirely sure how to proceed from there or how this would all play out in the public space at that point. Then, Friday morning, the screenshot made its way to NeoGAF and chaos ensued. I was in the process of writing a statement that entire day to address formally address the allegation, but the community had erupted in a flash that morning. While the moderation team was trying to restore the peace, accusations and threats concerning the screenshot started shifting to them as well by association with me, and I was asked by my team to do something to fix things and get the heat off of all of them at least. I was beyond exhausted by that point, though, stretched too thin in the time since the post had first appeared and seeing unprecedented events unfold on NeoGAF. I was slow and weak. I failed to handle it quickly enough and let the team down. Before I could finish a statement and get it out there, understandably some mods hit their emotional limit, expressed concerns about the community coming after them, and decided to leave. A few people resigned, and many more quickly followed for similar reasons, citing stress and harassment. The site started breaking under load spikes leading up to the first resignations, too, and then flatlined altogether, so issuing a statement at that time on NeoGAF itself became impossible for the time being, and my attention shifted toward the moderation team’s future. Since that whole mess, lasting from Friday morning through Saturday, before we formally went offline for maintenance and repair and restructure, we’ve just been trying to figure out the best course of action for NeoGAF going forward. And as stories began being published by various outlets, I issued some comments to the press, since everything coming out was proving to be sensationalized, opportunist, and unprofessional. We’ve all become increasingly stressed and weary this year in ways even I’m not accustomed to by now, and discussions on heated news, political issues, and social issues on the off-topic side of the site have become areas no one has wanted to moderate in the open for fear of backlash or just general exposure to the inevitable toxicity. I’ve gone in there myself to take the heat, since it’s very much my responsibility to do so before anyone else’s, but there’s been little headway, mostly just more anger and resentment and a lot of bans. I don’t think this necessarily reflects on our community; more so the tone of the entire internet this year with regards to heated issues. That’s all going to inform the way forward for NeoGAF as we refocus on what the main goals are supposed to be for the site. The mod team will talk about more specifics on what that will entail below. One last thing. The NeoGAF mod team is here for this community; all of you. You have no obligations to respect me or believe anything I say about my personal life one way or another, but if you’re going to be here and participate on NeoGAF, respect the mod team by following the rules and behaving. The team is diminished at the moment and the folks who stuck around care very much about this community and its future. Be considerate of them. That’s non-negotiable.